Faculty and students utilizing the new Consumer Insight and Sales Lab. Students in USF St. Petersburg’s Kate Tiedemann College of Business (KTCOB) will soon have the unique opportunity to learn from and participate in professional consumer focus groups that are a staple of marketing and political research. Tucked into the third floor of Lynn Pippenger Hall, the Consumer Insight and Sales Lab (CISL) is poised to begin serving its first official clients in the Tampa Bay region and embark on its own research project, building a marketing database on preferences and habits of millennials. “We don’t have many of these facilities in the Tampa Bay area, so CISL will be a valuable resource for the community. And from an academic standpoint, this will be a wonderful opportunity to show our students how market research works in practice,” KTCOB Dean Sridhar Sundaram explained. Earlier this year, CISL previewed its professional services with the Tampa Bay Rays, who wanted to learn from season-ticket holders about the in-game fan experience. CISL Coordinator Elliott Wiser moderated the panel of fans while KTCOB faculty and Sales Program Coordinator Dr. Edward Hoeppner observed from behind the one-way glass with the Rays management team, offering analysis and input along the way. The focus group process is as follows; when a company signs on, Wiser meets with them for a “problem definition session” to help clarify the goal. Next, they develop a questionnaire for the panel, making sure everyone’s expectations are aligned. Wiser then recruits appropriate panel members in coordination with a recruitment firm in Washington D.C. Finally, a KTCOB professor observes the panel session along with company representatives and helps draft the findings for the final report to the company. While CISL helps KTCOB raise its profile as a research leader and resource in greater Pinellas County, it will also provide business students with a unique learning opportunity. Wiser and Sundaram believe companies contracting with CISL will grant permission for KTCOB professors to use portions of their data for case studies in marketing and sales classes. For example, marketing students will be able to watch recordings of panels to help hone their analytical and observation skills. 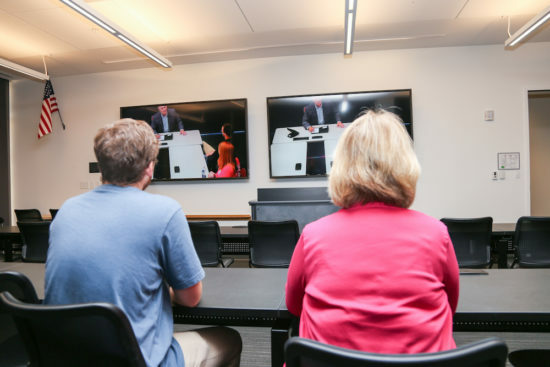 High definition cameras and microphones capture video recordings and clean audio of the focus group, which can be analyzed on two 90-inch HD monitors. 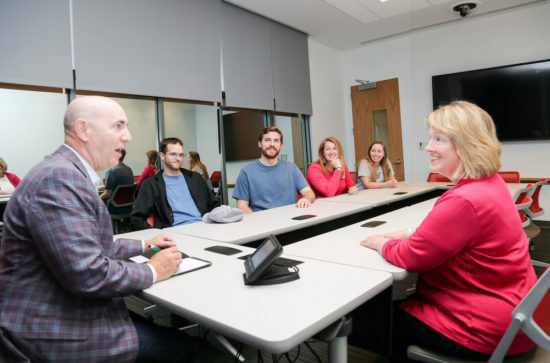 Students in Hoeppner’s sales classes will gain valuable experience translating consumer insights gleaned from focus groups into improved sales pitches that they can then practice in CISL’s recording-enabled role-playing rooms. KTCOB professors are poised to begin collecting data of their own regarding millennial habits and preferences, with USFSP students serving as focus group participants. The hope is to build a large generational marketing database that KTCOB faculty can use for research purposes. Students interested in participating in the data-collection process would gain insight into how primary databases are built and potentially applied in a commercial setting. Along with providing hands-on learning experiences, CISL will offer KTCOB the chance to further develop and strengthen relationships with area businesses and community partners, which Sundaram believes will translate into increased internship and job opportunities for business students. Interested in learning more or working with CISL? Contact Elliott Wiser, ewiser@mail.usf.edu or 727-873-4019.